Stuck! It rained 3 nights in a row, and it caught up with me. Next time I'll commute from the KOA. 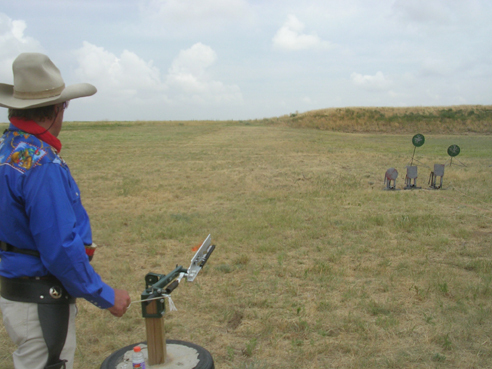 The beauty of shooting at SASS matches is when some disaster like the above occurs, without my asking, the remaining members of the host club, the Sand Creek Raiders, congregated on the coach. It took 2 hours or so, but they got it out with no apparent damage. A 18 ton road grader was procured. First attempt broke the tow strap. Eventually 3 were used. Multiple guys dug out the stuck tire and added wood ramps. We disconnected the trailer, of course. Next pull got the coach out. One of the guys hooked up his pickup to my trailer and placed it where I could back up to it. I was trying to get everybody's name, but the grader driver, who is in heavy equipment and thus knew what he was doing very well, asked that I just say it was the Sand Creek Raiders who did it. 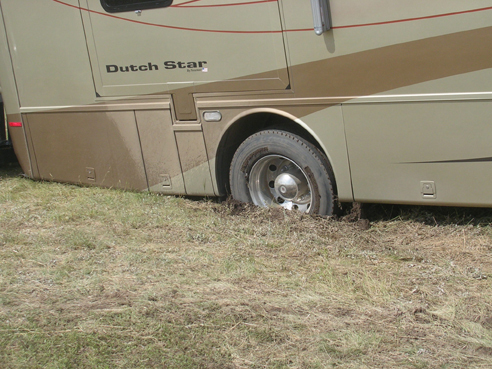 I will give special "mentioned in dispatches" to Robert, a young man who really put an effort in helping dig the stuck tire out, really dirty hard work. He had recently spent 4 years as a Marine infantryman, with, of course, a dangerous tour a an entry team leader in the sandbox of crazies. He wanted me to know he wasn't just a Marine, but a Marine infantryman. I understand the difference. The Army gives a special badge for infantry combat. They understand. Having experienced a bit of infantry combat once upon a time, I understand. Needless to say, all those who were present and helped get as many free Margaritas as they want next time we meet. We made it ot the KOA after 6 and had multiple frozen Margaritas. Last five stages were in bad weather for us shooters of the smokey stuff. Had to do a lot of waiting for the smoke to clear and got 2 misses when I didn't wait enough, another one. Good posse. We had a 4H Girl picking up brass in exchange for tips. Great idea. Bat Masterson did a great job as posse marshal. Don't remember any problems. Baylor dressed as John King Fisher complete with tiger skin chaps and English Stranger dressed as an English stranger. English Stranger shoots Open Tops with VERY short barrels and a very short double shotgun. 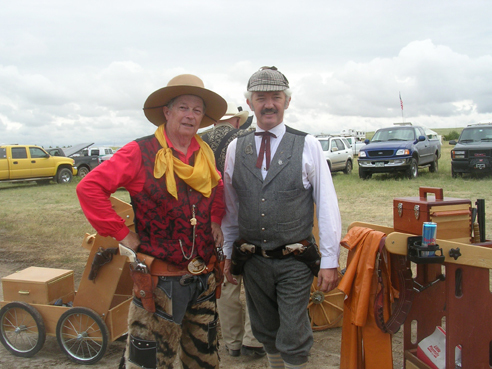 You'll notr my extremely authentic US made Fish Raincoat is on the guncart. It was actually used in rain the first time. Yes, the ROAs went bang EVERY time even in the rain. Stealth balls were rare because I use balls from the Bigger Balls Bullet Co., Inc. "It takes Bigger Balls to shoot Rugers." The party at May Farms was a good one. Bad Gene Poole won Frontiersman as expected. I was second. 6 entries. 5 actually showed up. John King Fisher won best "Working Man". Col. Baylor was second in the evening costume contest to another Confederate Colonel, Sweetwater Bill. The drive back was really scary. It had rained AGAIN. The main road wasn't passable, so we were told to take a different unpaved road. Back in my SCCA rally days, this would have been fun, but I could see a lot better then, and my co-driver was as crazy as I was. It was good to be in a 4WD Mercedes. Shot the first five stages in the afternoon. Walked around and looked at the stages in the morning. 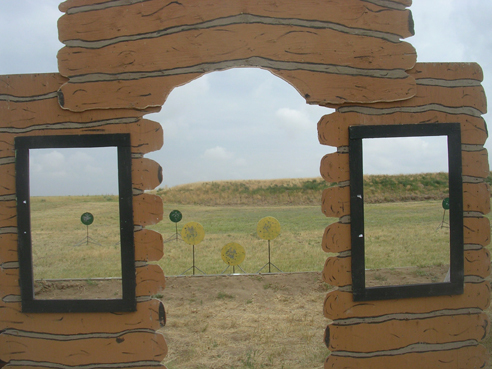 See the straw colored pistol targets in front of the straw colored background? Stage three had a board wit h 6 months worth of leftover catsup from someone who must live on McRonald's fries. You were to make one of the packets "bleed" catsup to get a 10 second bonus. I must admit I've never seen that one before. Got a reshoot on that one, so I had to hit it twice. Had one miss, if I remember correctly. Casino night at May Farms, 20± miles of bad dirt roads away, was a lot of fun. They gave away side match awards then, thus speeding up main match awards tomorrow night. Good idea. Won fastest pistol and shotgun--Frontier Cartridge. The Redhead, sensing that I don't get too many fastest anything awards, said, "We'll keep those." Bad Gene Pool and Sheriff Pack Wolf battled it out on most of the long range awards. Gene has to do a shootoff tomorrow for second for one of them. English Stranger was a great dealer for 3 Card Poker. His knowledge of the game was astounding. The Redhead and I won a lot before she got hungry. Didn't matter. One traded one's winnings for tickets for door prizes. We didn't win anything. The storm from hell came through while we were there, making the drive back a hairy experience. Then we dried out the coach. We'd left some windows open. 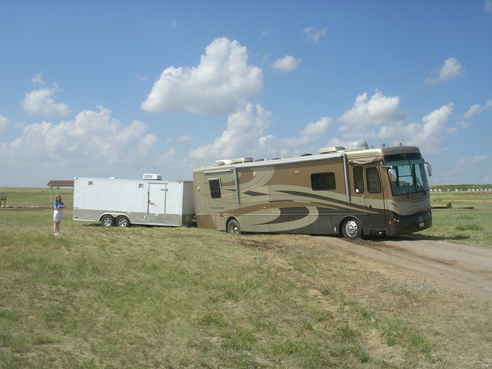 Camp Baylor is parked just a few yards from registration, which is good. I awoke with the great mother of all headaches, which I attributed to caffeine withdrawal. Solution, of course, was to crawl out of bed and turn on the coffee maker. By time for the shooters meeting I had it down to a manageable level. 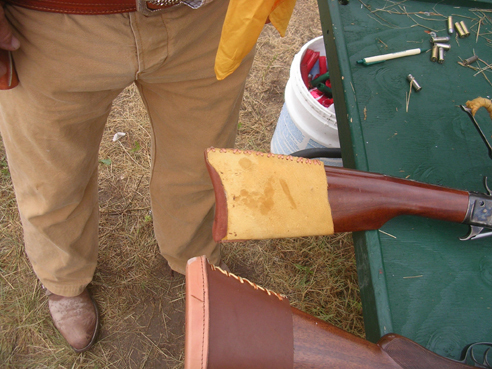 I shot fastest rifle, pistol, and shotgun for warmup, then Plainsman, using Bad Gene Poole's rifle. Plainsman was 2 stages. it should be noted that some sadist painted most of the targets sand beige, a close match for the background color. Fastest Rifle and pistol had all beige targets, Plainsman used them for pistol. 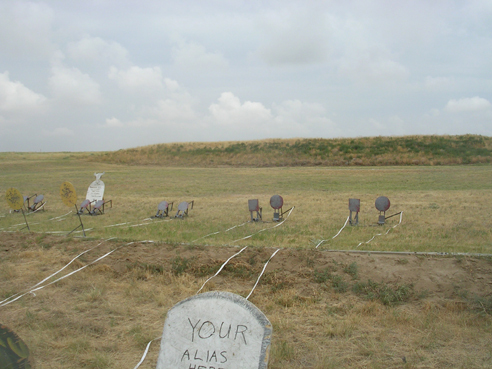 The rifle targets were painted orange but at 50, 75, and 100 yards nominally. Beige targets would be appropriate if all of the contestants were 19 year old Marines preparing for duty in the sandbox. But the average SASS shooter is over 60. My eyes are about 95 due to (big word warning:) anterior bilateral ischemic optic neuropathy (1995) and macular edema complicated by a pseudohole* (2007, left eye only). So I might be overly sensitive. Fortunately I'm happy that I can see to shoot at all after all that. *No, I don't understand most of it either. The first Plainsman stage had an on-the-clock hatchet throw for a 10 second bonus. No one got the bonus. It also had capping the 6th chamber of one pistol on the clock. The second stage was more conventional. Bad Gene Poole won. Sheriff Pack Wolf was second. Using Gene's excellent .38-55 H & R I was a distant third. I need one of those rifles, with two ejector barrels. That means getting a Rock Chucker and .38-55 dies. This having time to actually practice could get expensive.